The mission: to review the same game on three different systems. The rules: I have to own an original copy to play on the original hardware. No fair! I hear retro gamers cry, an Atari 2600 (VCS) against a 16 bit Sega Genesis (Megadrive), there is no comparison! 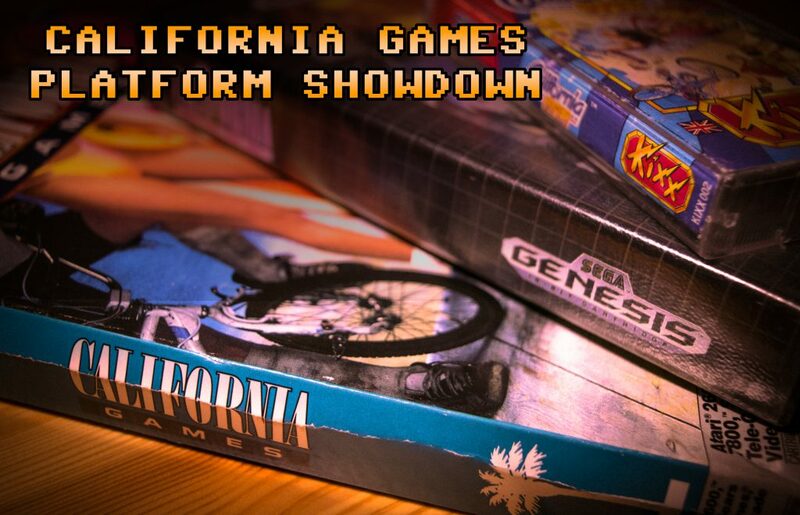 Rest assured, the goal is to play and review California Games on each system by focusing on the merits and how far they pushed the respective system. Sure I could download game ROM’s and emulate each platform the game was released on, but I want to keep the experience real, the feel of the controller, the knowledge that real bits are being switched in the system’s memory location’s. For full disclosure, on the C64, I’m using a disk image on a SD2IEC floppy drive emulator. I do own a tape copy of California Games, but life is too short to wait 5 min for each level to load from tape. 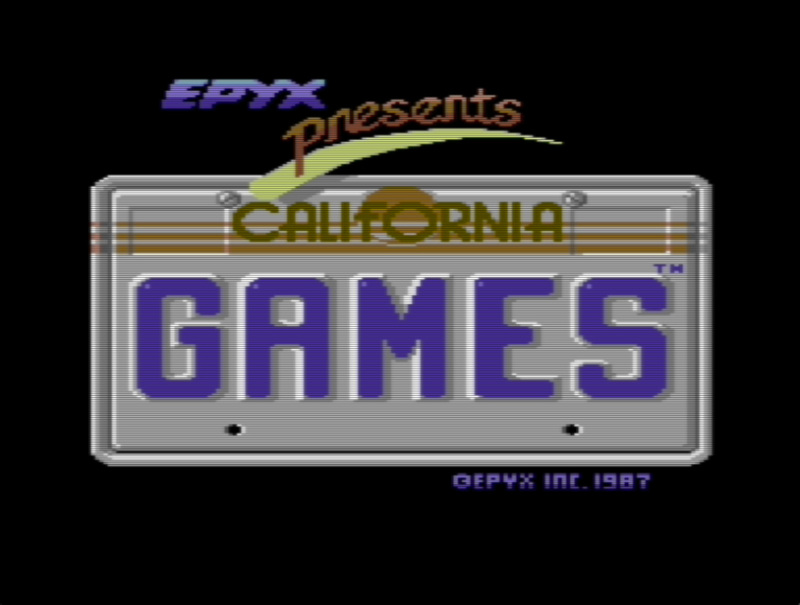 California Games was the fifth and most successful title from the software publisher Epyx, who are also known for their Fastload cart that created speed induced dizziness on 1541 drives for the Commodore 64. 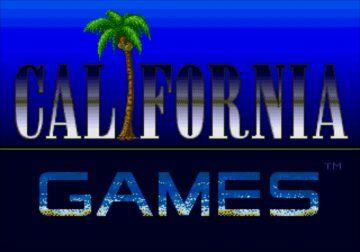 Previously released titles to California Games in the Epyx sports series were: Summer Games, Summer Games II, Winter Games and World Games, they were all successful titles in their own right. 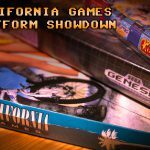 In this article, I’m not going to chronologically record events or the development that lead to the final “Games” release, but it is worth noting for context how the previous titles influenced California Games. 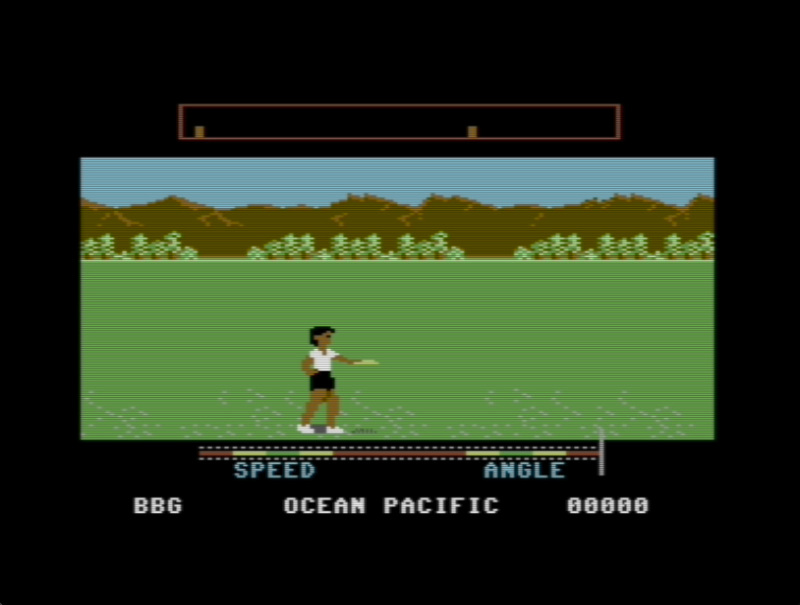 The first Summer Games, released in 1984, piggy backed on the fever of the Olympic Games held that year in Los Angeles, CA. Eager to continue their success run, Epyx went to work both internally and externally on the next three titles: Summer Games II, Winter Games and World Games. 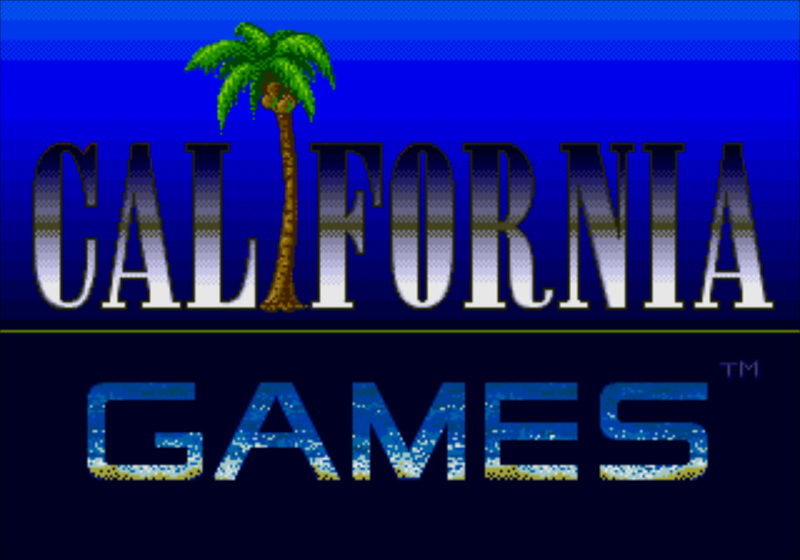 Finally, drawing on the companies roots and office location, they set work on California Games. The games events are modeled around what are now more commonly described as “Extreme Sports”, and what the authors saw as equisentially Californian. Myself being a non American and growing up during the 90’s in the UK, my friends and I had a very modeled view of California. To us, what identified as “West Coast”, were images of the Hollywood sign, beaches, palm trees, skateboards, surfing and, well… blond girls. 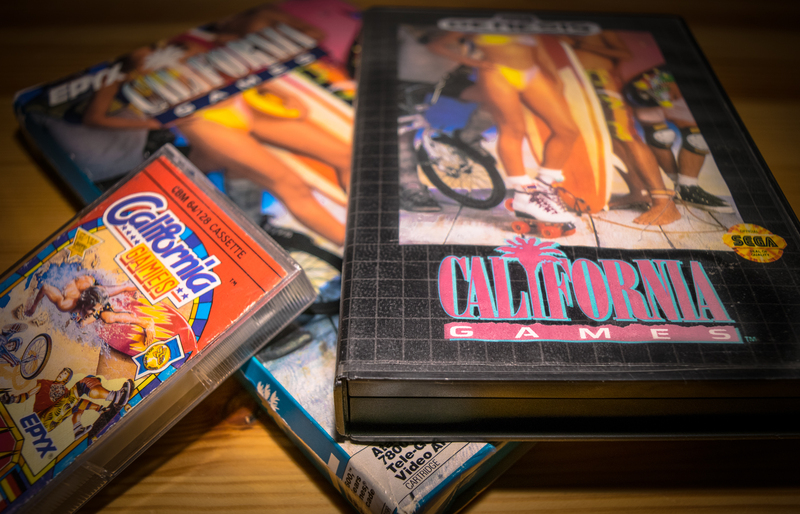 All of which California Games captures and packages for the rest of the world to consume. Just like Hollywood has always done. Originally only released in 1987 for the Apple ][ and c64, California Games’ success was soon realized and ports to other systems quickly followed. The choice of initial launch platform is an interesting one, when you look back from a historical perspective. 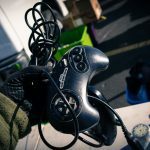 The demise of the early consoles was firmly in the rear vision mirror for most of the industry; Nintendo had arrived and restored faith in video games as a viable product to retailers. Affordable 16bits had hit the scene, the Commodore Amiga and Atari ST were making their way into homes and were on the verge of wide spread adoption in some markets. Yet Epyx continued to support the platform they cut their teeth on, technically the Apple ][ wasn’t a far stretch from the c64, they both share similar 6502 architecture. Porting between the machines was a lot more viable from a development time perspective. 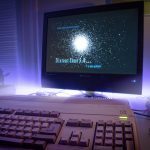 1987 was also the peak for the Commodore 64 and home computer based gaming, markets in the U.S were shifting towards console systems again. Commercially it makes sense to develop for systems you have more experience with, to test the waters on how well a product will be received. Development for many other PC and gaming machines soon followed. 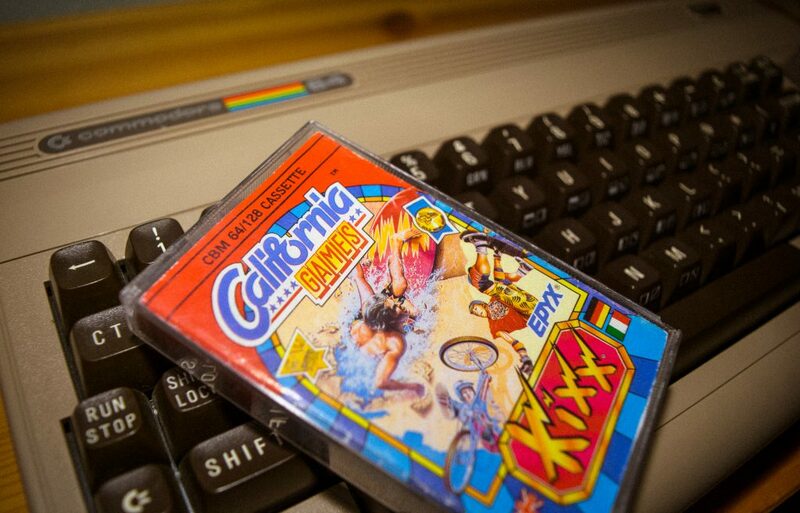 But the sense is that Epyx were trying to hold onto and eek out the last drops from the 8bit machine. The next two years proved to be tough for Epyx, subsequent games didn’t yield the sales the initial release of California Games did. 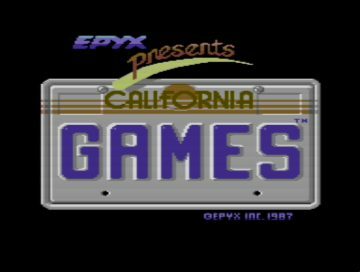 Coming off the success of California Games in ’87/’88, Epyx boasted a staff of about 200, by the end of 1989 they were less than 20. 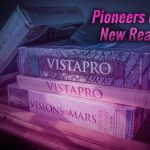 The long death throws dragged out until 1993 when the last of the company was sold off, it was certainly a painful demise for a company that produced games with a long legacy. 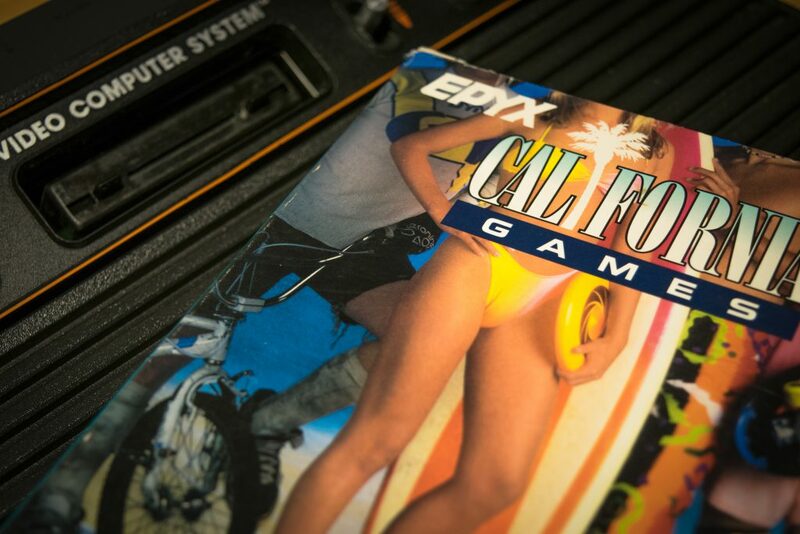 Playing California Games on the founding platform seems like an appropriate place to start. My experience playing the game is slightly skewed, instead of loading the game from tape or disk, I used a .d81 image on a SD card, disk drive emulator, to say my loading times were reduced would be an understatement. The intro screen sets the tone of the game, the number plate styled title sequence is detailed and crisp, and maximum use of the 64’s 16 color palette has been made. The Sid chip thumps away to a well emulated bass sound track. It’s a very flashy affair. As with the other platforms reviewed, the game can be played by 1 – 8 players and each player selects a team or brand to represent. Compared to the 2 other system I played on, the Atari 2600 and Sega Genesis, the team selection art work is more detailed, even with the limited color palette. Opps, just missed the mark! The first event, Half-pipe or skateboarding, is framed by palm trees and the hollywood sign, the perspective of the sign and hints of detail in the hill side is convincing. Unfortunately, regardless of what system I’m playing the game on, I can’t get the hang of the controls for this event. I was never was much good on a skateboard! 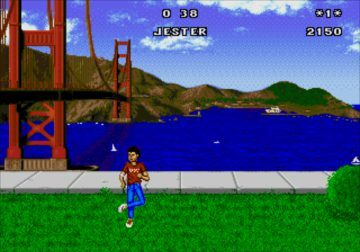 Footbag is set in the bay of San Francisco with the Golden Gate Bridge in the distance. The whimsical detail of boats in the harbor, seagulls flying by (which you’re able to hit with the bean bag) and rolling surf sounds, all add an enjoyable atmosphere. The only addition the event could have benefited from, would be some animated clouds. I found the surfing event to be a lot easier than the other 2 reviewed systems, it was less of a challenge to get out ahead of the breaking wave, on the flip side, scoring extra points by riding the “tube” is more difficult. The whimsical design pattern is carried through to this event in the form of a shark, which bares a close resemblance to Jaws, that swims by after you wipe-out. 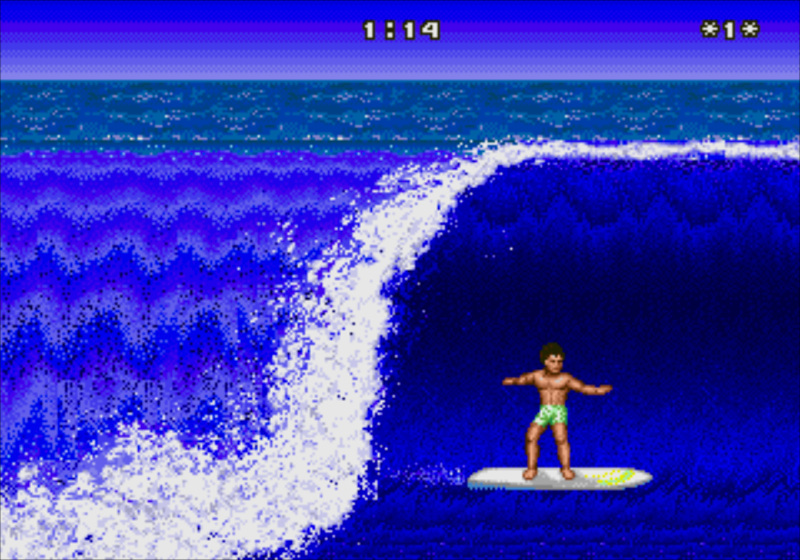 By far the most notable feature of surfing was final score screen. The pixel art beach hut with a crew of very beach complimenting characters holding up your scores was something I didn’t see on the other systems. It was evident a lot of work went into this event footnote. Skating was the one event that didn’t quite click. The background scenery and beach life is very sparse and left me a little underwhelmed. To top it off, the control mechanism wasn’t able to cope if you got stuck in sand. 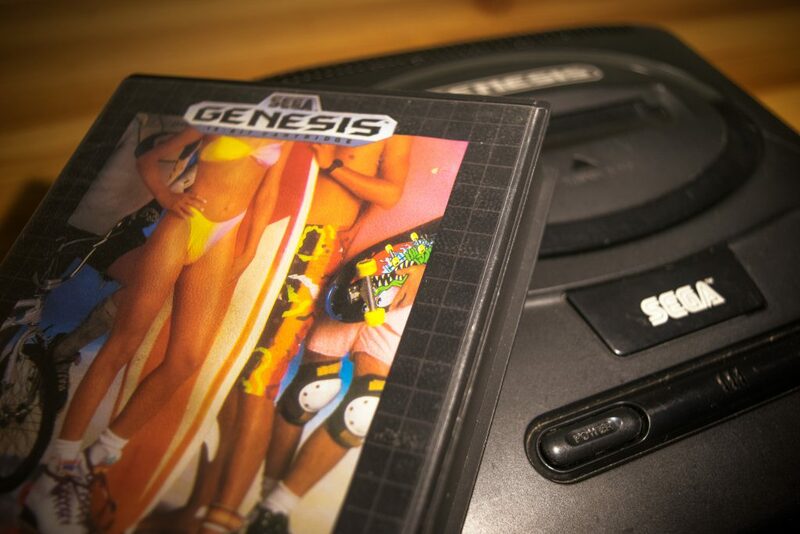 It could be said the Genesis version definitely out shone the ’64 in terms playability and atmosphere. 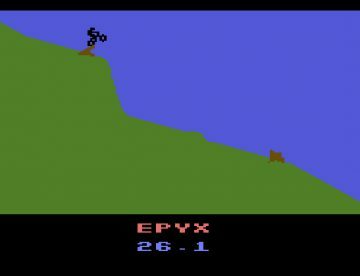 BMX played very similar to the Sega Genesis, the rocky terrain and back drop was clearly ported over to the latter Sega platform. Unfortunately, the collision detection seems to have also made it’s way over. Both on the ’64 and Sega, some of collisions with obstacles seemed very implausible. Last but not least is flying disk, of the three platforms played, only the c64 has this event so there isn’t really much to compare it to. Flying disk is a fun event, I’ve read that a fly saucer appears, following the trend of whimsical features but I didn’t see it myself. The mountain backdrop is crisp and clear, kind of what you would expect from real mountains. On the Atari 2600, California Games appeared REALLY late in the consoles life. By 1988 the machine had already been on the market for 11 years! Needless to say, developers for the machine had had a long to time figure out how to squeeze the most out of the system. 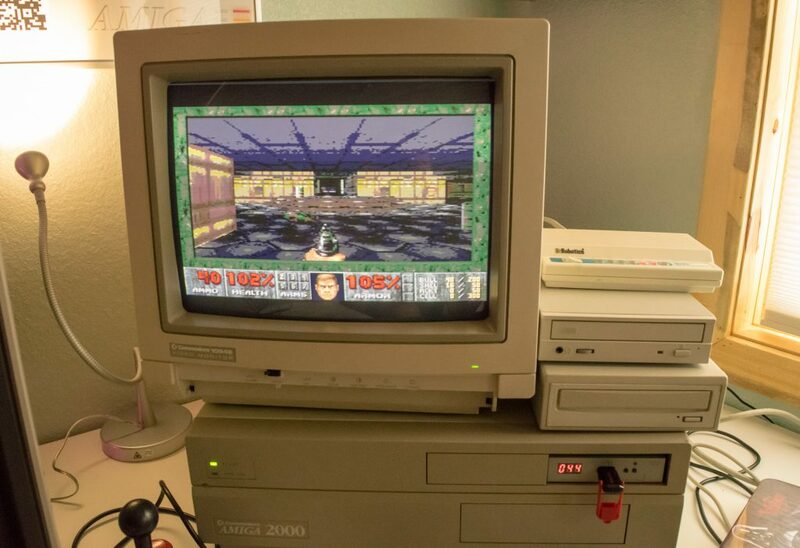 Typically, ROM’s came in a 4kb size and along with a few programming tricks, the only way to bring gamers what they were expecting from contemporary games was to pack in more storage, bringing the total space for this game to 16kb. Throughout the game you can see the platform specific compromises made to be as true to the original as possible, while working within the limits of resources available. Two perfect examples are on the intro screen and the Surfing event, where the developers utilize raster routine effects to create a compelling intro and a convincing breaking wave. Footbag – The gradient effect of the sky and movement of clouds was an enhancement I’m not used to seeing on the 2600. The sprite is happy and cheerful without being cheesy, even if he does lack a few of the moves like reverse bean bag pick up that are present on the other game versions. 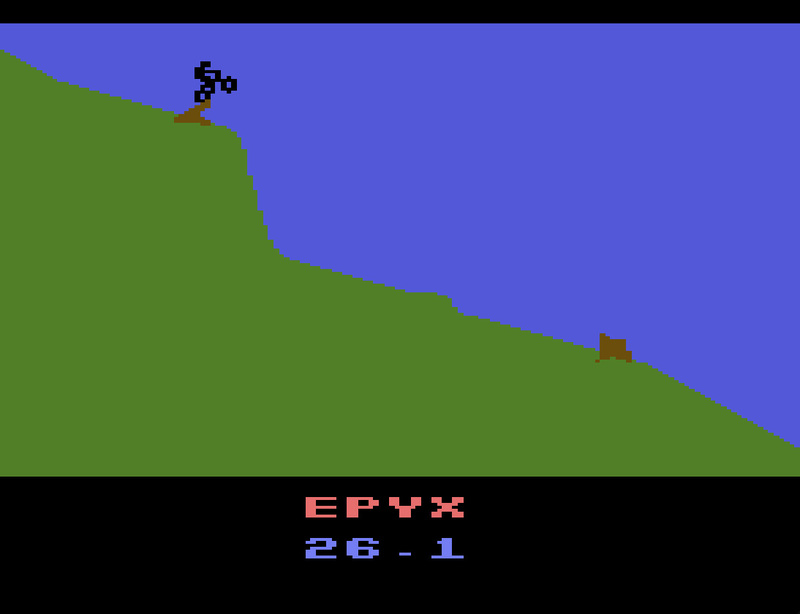 BMX – The developers took their own twist on the event, instead of the isometric view seen on the c64 and Genesis, you play on a downhill 2d course. This configuration is so much more playable! The animation is smooth yet fast, jumping obstacles is easy to get the hang of and fun. The little box from the 80’s with fake wood trim out did the 16bit machine in my opinion. 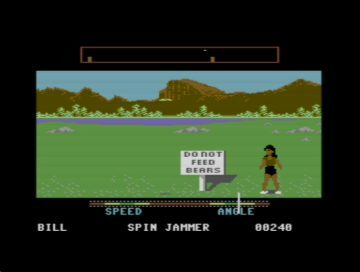 As mentioned previously, 2 events were cut from the Atari version: flying disk and skating. Given what the development team had to work with, I would say they did a legendary job. As to be expected, California Games takes full advantage of the hardware and resources available on the 16bit Genesis, like the other platforms reviewed, the developers injected unique touches on the Sega version too. Yeah! Gotta love the 80's! The technology updates harmoniously compliment the style changes implemented in this release. First, the intro screen received a refresh and true to the era, it has a very Miami Vice atmosphere but with the familiar “Louie Louie” sound track. Skateboarding (half pipe) is reassuringly and familiarly difficult, just like the other versions. So is the background detail, set on the detailed and digitized hill side is again, the famous Hollywood sign. What is missing from the Sega version is the sponsored billboards behind the ramp, in their place, is a busy freeway, another accurate touch of Californication. Footbag is still set on the San Francisco bay but the bridge has been brought closer to foreground. Like the Skateboard event, the sky and park setting have received the digitized treatment, a bonus feature that adds to the atmosphere. Surfing actually plays a lot like the c64 version, more effort is to get ahead of the wave before your surfer can pull some gnarly moves. What is missing are the comical touches like the shark and dolphin. Instead of receiving your final score from a crew of beach dwellers, scores are presented on a disappointing text based display. What I did find impressive was seeing the main sprite through the waves as he enters the tube. The true highlight of the Genesis version has to be the boardwalk skating. The controls have been improved over the c64 version and while I feel this event benefits from a few practice sessions, it’s not impossible. Along the beach and sidewalk, characters fill out the scene, creating an atmosphere I would expect for the location. For the final event, we head to the desert for the BMX course. As mentioned previously, the Sega version has a lot in common with the c64 release, right down to the quirky collision detection. There’s also something off about the physics, at the speed your sprite’s bike is traveling, you would expect to clear the hurdles. Picking a version of the game that is better than the others is a hard task. Despite the obvious differences and improvements over older machines, each version has it’s own qualities, personalities and playability. One common thread runs through all versions, it became clearer to see as this review progressed; a producer direction was given for each version in both the senses of art and game design. There is evidence the teams converged and examined what could they do differently. To find what capabilities of the target machine could they exploit, while remaining true to the soul of the original game. Interestingly enough, when I first played this game, it wasn’t on the c64 or the Amiga that I owned in the 90’s, it was on the Atari Lynx. Comparing only three variations only skims the surface of what was a 15 platform release, and who knows, maybe I’ll revisit this examination once I have collected a few more versions.